I'm sure I've mentioned before that I help moderate a gothic literature group over on Ravelry. We pick one of the classics to read and discuss while concurrently knitting a project on theme. Our last book was Rebecca by Daphne du Maurier. It might be my favorite so far, but (with the notable exception of our Hawthorne excursion) I keep saying that every time we finish a book. I knit the very appropriate Sand and Sea Shawlette from Coastal Knits to commemorate the reading - a little something to for the new Mrs. de Winter to wrap around her shoulders while she wanders the haunted, chilly halls of Mandelay. It's knit from a silk/alpaca blend that I serendipitously found under the Christmas tree days before the read-along was to kick off (thank you Marc and Raissa), and then trimmed in a wool/silk blend in a colorway called "Deep Blue". It reminds me of the jungled path that led from the mansion house down to the sea cove that proved so treacherous in so many unexpected ways. 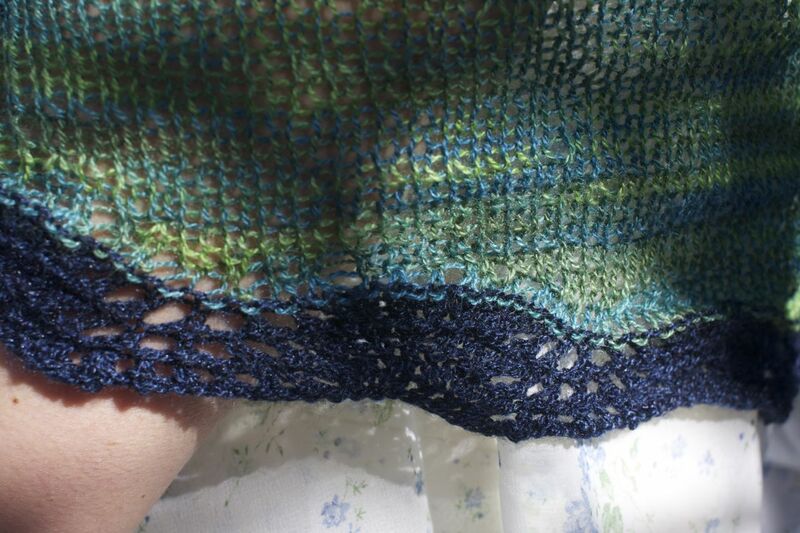 As usual, the knitty-gritty details are available on my Ravelry project page. I highly recommend "Rebecca", which reads like a ghost story but truly has more to do with skeletons in the closet.